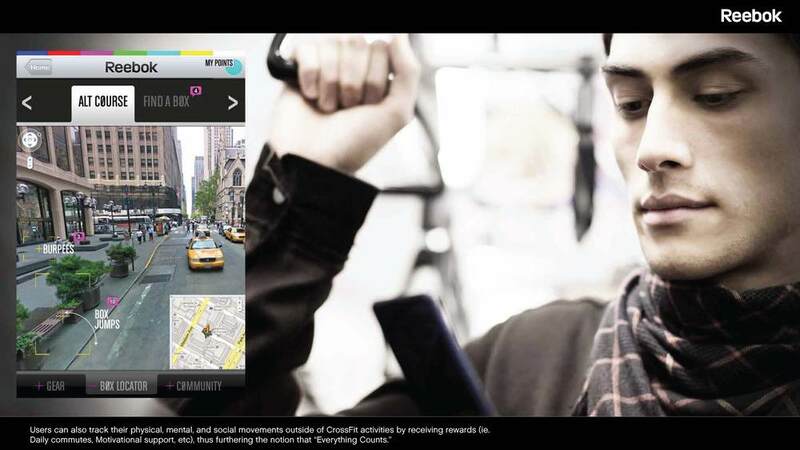 Reebok products come with hang tags that feature the app, while in-store screens broadcast actions and accomplishments from the Reebok CrossFit community. 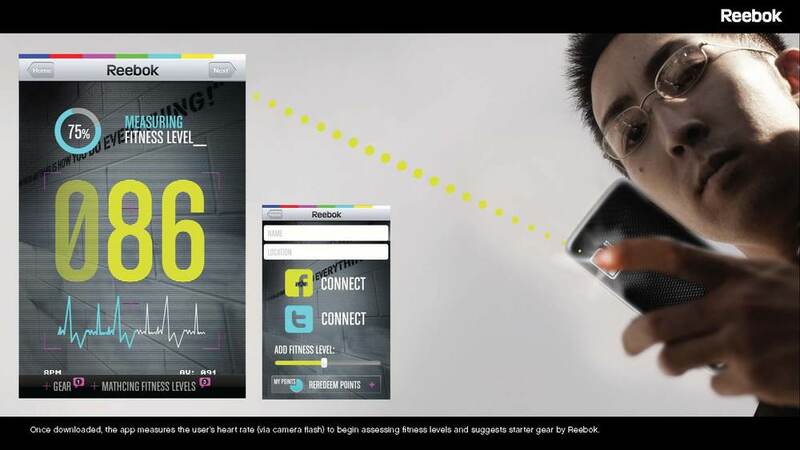 Once downloaded, the app measures the user’s heart rate (via camera flash) to begin assessing fitness levels and suggests starter gear by Reebok. As more information is added to the app (ie. 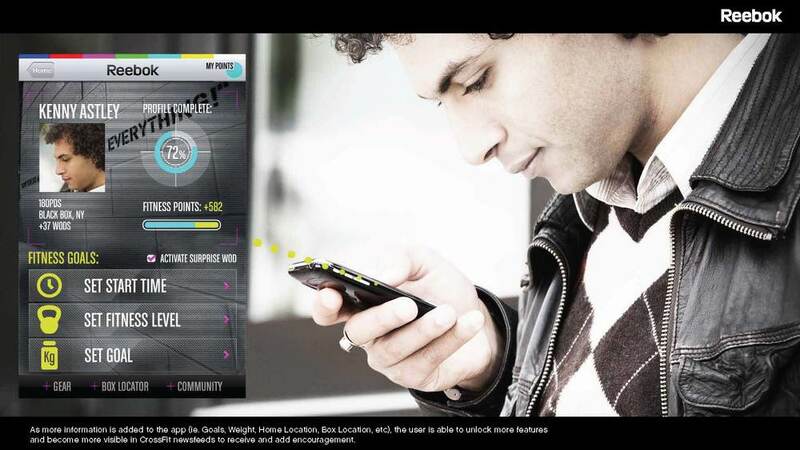 Goals, Weight, Home Location, Box Location, etc), the user is able to unlock more features and become more visible in CrossFit newsfeeds to receive and add encouragement. Users schedule fitness alerts, which prompt them to get up, view the WOD, get nutrition tips (the Meals of the Day, shown here), and see who else has already participated. Users can access the “Trainer” portion of the app, which displays the correct form and function of each movement and delivers motivation from top CrossFit trainers and athletes. The user can control the WOD experience using on screen controls or “voice command”. The results of each WOD are shared amongst the Reebok CrossFit community, and can be broadcasted across other personal social networks as well to invite text and video responses. High point scores become eligible for discounts and exclusive Reebok shoes and apparel. Along with other questions, this diagnostic directs the user to either the Beginner or Elite version of the app, which features appropriate workouts, gear, motivation, and communities. Box v Box - Compete against other boxes from around the world by posting your WOD results or issuing a direct challenge. WOD Creator - Members who have gained enough points in the app are able to create their own WOD, which can then be exercised by others. Tips - Members with certain amounts of points can offer guidance to others, and have their comments voted up or down by the community for lively conversation. 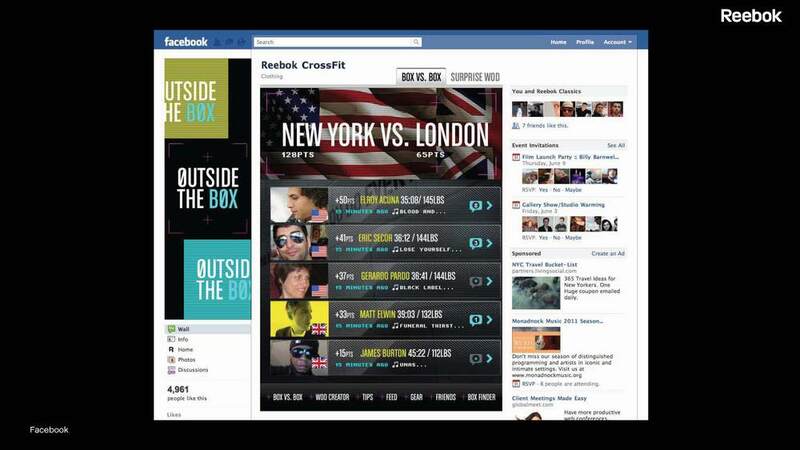 Feed - Results, accomplishments, and other newsworthy items related to Reebok CrossFit are aggregated from global CrossFit sites in a data feed for realtime updates. Gear - Explore each of Reebok’s shoe and apparel lines, including product designer interviews and recommended usages. Friends - View results and updates from people within the CrossFit community. Box Finder - Find CrossFit boxes nearby based on automatic geo-location features and/or Google Maps integration. 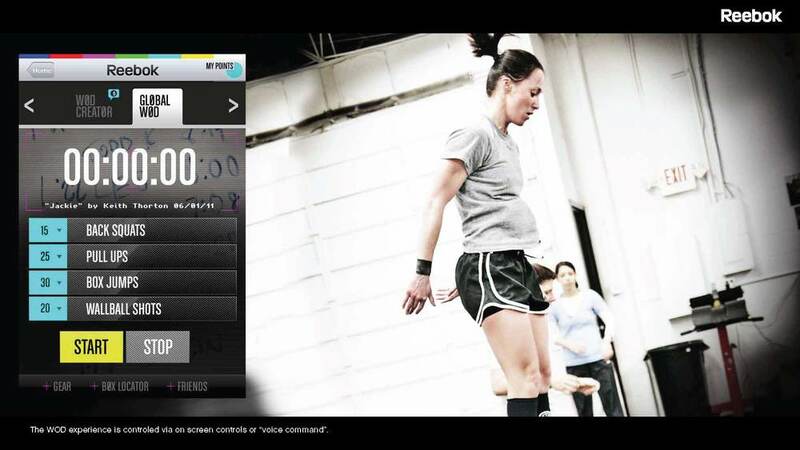 Members who have gained enough points in the app are able to create their own WOD, which can then be exercised by others. The WOD experience is controled via on screen controls or “voice command”. Elite users can compete against other boxes from around the world by posting their WOD results or issuing a direct challenge. Facebook Tab featuring leader-boards and other activity from popular members. Responsive design for a mobile version of the site. Copyright © 2019 Lorem Labs. All rights reserved.